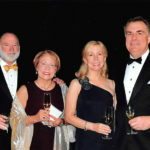 Our law firm was a corporate sponsor of the Annual Gala Dinner at The Dali Museum. Jay Fleece, Cynthnia Fleece, Ria McQueen and Bill McQueen. Lucas Fleming, Tara Fleming (they were guests of ours) and Bill McQueen.